The Teacher. cookery school! 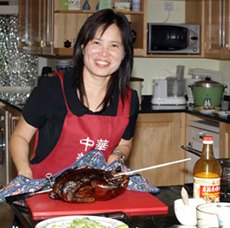 Chinese cookery school! Hannah Hayes was born and brought up in Taiwan, where there is a great variety of Chinese cuisine. Hannah comes from a family with great passion for food. Her mother teaches cookery lessons and Hannah has inherited her love for food and cooking. Hannah has also undertaken cookery training in Taiwan with chefs in 5 star hotels.